The double arpeggio is a way of breaking up a chord using the fingers of the right hand. It is commonly used in flamenco and is one of the first challenges that comes up in early studies with soleares. This is also a great way of ensuring a good right hand position for classical, flamenco and folk technique. The right hand finger pattern is p i m a m i. The first thing to learn is ‘planting’ – as you play each note you plant your finger on the next note to be played. Practice unbelievably slowly to consciously get this movement right. As you get faster you will get a sensation of just keeping one finger on the strings at all ties. It reminded me of a lizard keeping cool, he has to keep something on the sand, you have to keep just one finger on the strings. Next set a metronome to 68 bpm and play 3 notes per click. Repeat 12 times. Next play the p note and a note in quavers with that same metronome setting to give markers for the start of 3 note chunks. Then play all 6 notes at that metronome mark hearing the p note and a note in quavers. After that you should be able to drastically speed up. Keep the thumb pointing through the guitar sound hole to keep the fingers quite straight. This makes the movement easier and the tone better. Make sure you get the contact between each finger and the string exactly right or you’ll just get a mess. Don’t move on until each step is easy. On the right here is Narciso Yepes playing Villa Lobos Study No.1 which is widely used to learn the ‘planting’ technique. Notice how stable his right hand is! His thumb points through the sound hole and his fingers are only slightly bent. This is a far more complex finger pattern – pipipmiamapipi but the principles are exactly the same as I’ve outlined above. Once you’re getting the technique together it helps to have a chord progression to keep it interesting. 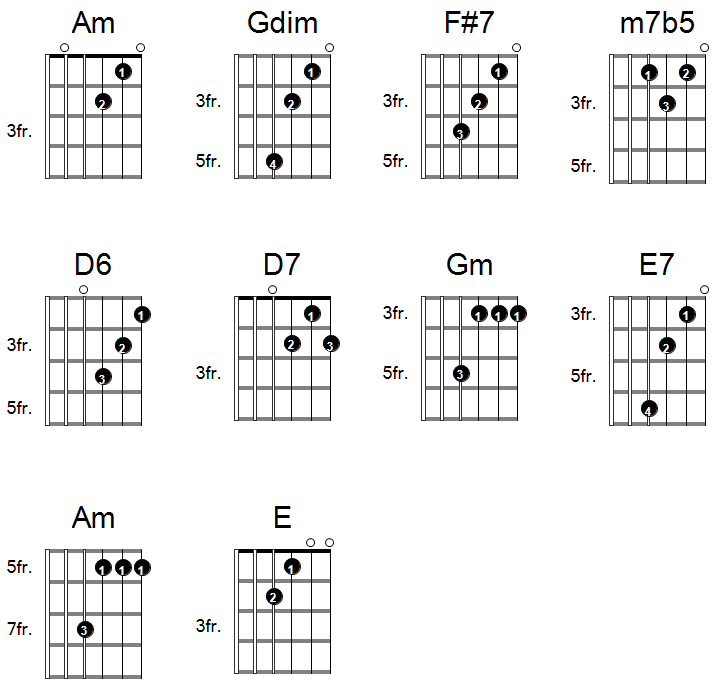 So here’s a batch of chords to arpeggiate. Notice the first chord Am is played with the thumb on the 5th string, all the others just use the 4th, 3rd, 2nd and 1st strings. 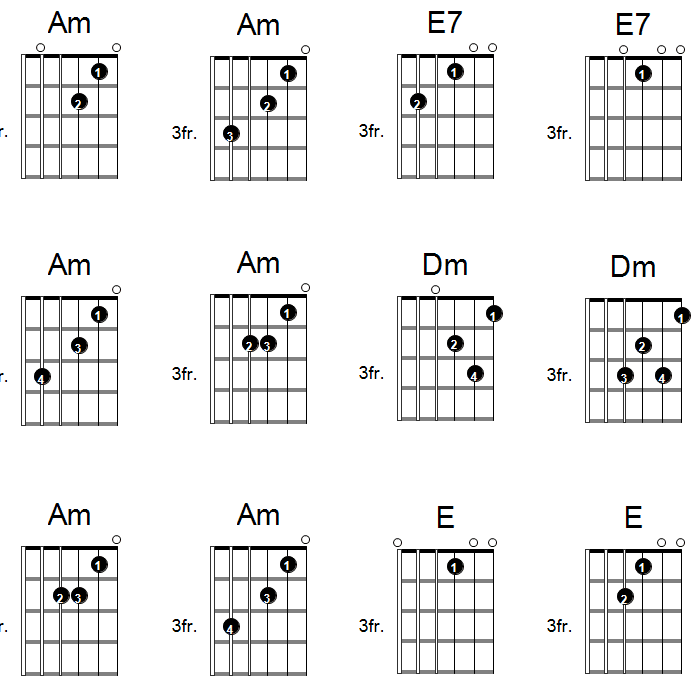 These chords just play the arpeggio once per chord to give a bit of drama. I like to repeat this whole section and then go back to the first batch of chords and then loop the whole thing.